Warning! Do Not Attempt To Handle Your Personal Injury Case Before Reading This Book! Valued at $16.95, but offered to California accident victims at no cost! Since 1988, Zev Rubinstein and his associates at The Rubinstein Law Group have handled thousands of personal injury claims and obtained millions of dollars for their clients. The firm has established a tradition of providing exceptional legal services by giving each client the personalized attention they deserve. Their goal has always been to help personal injury victims make informed decisions before taking any action. Knowledge is power and you should never settle a personal injury case without understanding all the factors that can affect the outcome of your case. 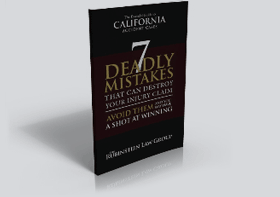 Please complete and submit the following form to receive your free copy of Zev Rubinstein’s book, “7 Deadly Mistakes That Could Destroy Your Injury Claim” and our monthly newsletter.